Five day cancellation policy: For a full refund upon cancellation, we ask that you give 5 days notice of your room cancellation. If you cancel your reservation within 5 days of your arrival, you will be charged for one night unless we can rebook the room.
? 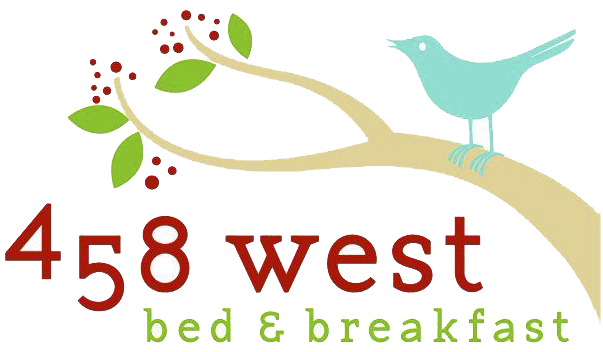 Rates are based on double occupancy and include a full breakfast. All charges are subject to applicable taxes.
? A credit card is required when making a reservation. We accept MasterCard, Visa, and American Express.
? Sorry we cannot accommodate pets.
? Smoking is not allowed in the inn or on the porch.
? 458 West is not suitable for small children.
? Deposits may be required for booking two or more rooms. Call for details.